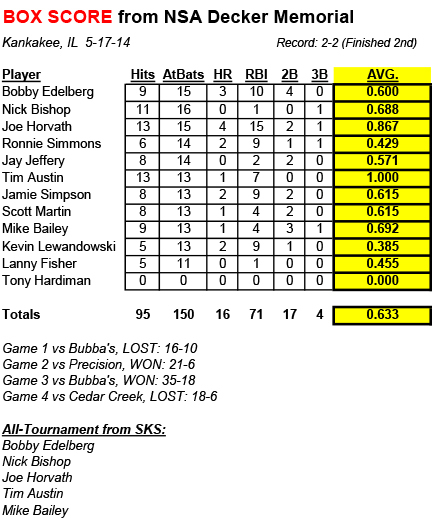 Street Kids came back from an early loss to Bubba's Excavating to beat the former two time NSA World Champions and advance to the finals at the annual NSA Decker Memorial in Kankakee, Illinois. However, they would lose to Cedar Creek, 18-6 to finish in second place. SKS dropped to a disappointing 15-11 overall this season, despite their fifth straight top three finish. It was their second straight loss to Cedar Creek, dating back to the NSA Directors Cup on April 26th. Bobby Edelberg, Nick Bishop, Joe Horvath, Tim Austin and Mike Bailey were all named to the all-tourney team.